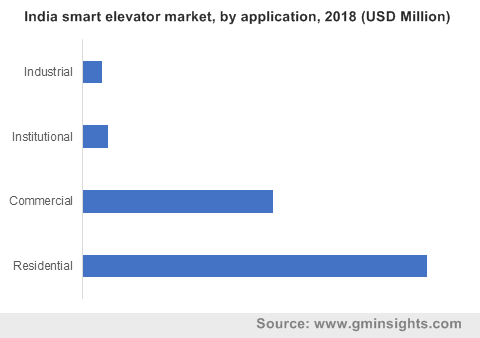 Smart Elevator Market size valued at over USD 11 billion in 2018 and is anticipated to grow at a CAGR of 13% from 2019 to 2025. 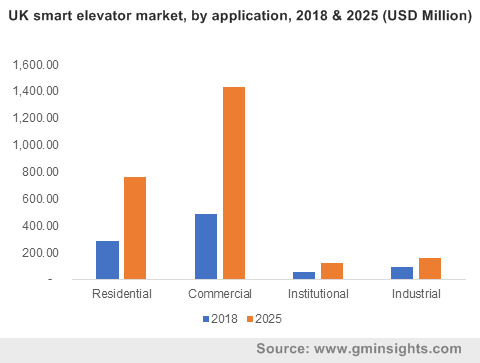 Increasing residential & commercial structure transformation activities through the integration of intelligent technologies are driving the global smart elevator market growth. The intelligent solutions are increasingly deployed to gain high energy efficiency, advanced security, and automation as compared to conventional lifts. Additionally, rising construction & infrastructure spending across the globe is a major factor supporting the industry development. This is attributed to the government & private investments in transforming the existing infrastructure and constructing technically-equipped structures. New buildings across all industry verticals are deploying technically-advanced & building automation systems to facilitate low energy costs, user comfort, and reduce the waiting time, contributing to the smart elevator market size. High initial investments and deployment costs associated with these systems are challenging the smart elevator market size. However, aging conventional systems and requirement of faster commuting solutions are supporting the high deployment of these lifts, facilitating rapid industry developments. The solutions also face malfunctioning issues due to complex building structures, the emergence of a huge crowd at peak times, and unavailability of continuous energy supply in some cases. The issue can be overcome by providing more connected solutions and maintaining efficient power backups to eliminate electricity cut-out situations. In the smart elevator market, control systems are expected to grow at around 15% CAGR from 2019 to 2024. These systems are gaining popularity owing to the enhanced management & security provided in crowded buildings. By deploying access control systems, efficient crowd management is achieved. These systems comprise video surveillance, advanced access control, and fast connectivity parameters that ensure high elevator security and passenger comfort. In commercial settings, the access control systems facilitate IT data & resource security by restricting the entry of unauthorized personnel and building occupants on restricted floors. These features aid in securing IT resources and allowing business managers to monitor & control building structures. In residential buildings, these systems are used to restrict the entry of tenants, salespersons, etc., on floors they are not allowed. These control systems act as deterrents against criminal activities, property damages, and theft activities in both commercial & residential settings. In the smart elevator market, new deployments are gaining rapid traction owing to the construction of several new structures in the residential & commercial segments and high demand for intelligent building automation technologies. Growing urbanization trend and consumption of digital technologies across the globe are the key reasons for the adoption of several new intelligent lift systems. Moreover, the increasing consumer demand for time-saving home & building solutions that facilitate comfort & safety will support the smart elevator market growth. Manufacturers are developing new solutions & digital platforms to facilitate quick & safe installation of new lifts and reduce delivery times. For instance, in October 2018, thyssenkrupp announced the launch of HoloLinc, its new Industry 4.0 solution that transforms the measurement & delivery in the elevator industry. This solution uses Microsoft HoloLens to facilitate direct customer interaction and assists the sales force to reduce the delivery time. 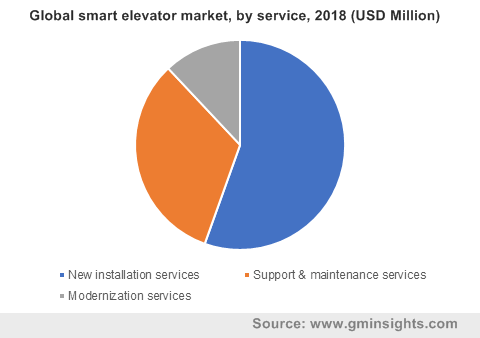 In the smart elevator market, commercial applications were valued at over USD 6 billion in 2018 and are growing due to the integration of digital building technologies and energy-efficient initiatives into commercial structures. The construction of high-rise commercial buildings such as shopping malls, office & retail complexes, healthcare facilities, theatres, etc., is driving the adoption of intelligent lift & commuting systems. Smart building management solutions adopted in new structures support the deployment of smart elevators to facilitate security and assist the occupants in commuting to desired floors in less time. Due to the smart grouping and signalization features, these lifts offer efficiency in eliminating long waits for commuters, accelerating the smart elevator market growth. In April 2018, Otis announced its plan to develop intelligent lifts that will communicate with passengers, service staff, buildings, and building automation systems to facilitate high efficiency. 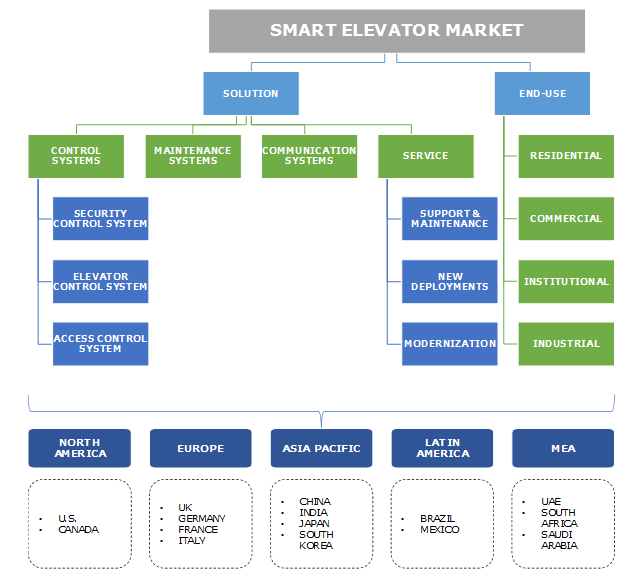 The Asia Pacific smart elevator market will grow at a CAGR of over 15% from 2019 to 2025 due to the increasing population and urbanization of countries including India, China, South Korea, Thailand, etc. To address the growing demand for residences & commercial structures from huge population, these countries are witnessing the construction of several buildings and integration of intelligent solutions. The building management teams are adopting these lift solutions to manage energy consumption in huge structures, adding up to the smart elevator market development. Moreover, the need for high-speed lifts and replacement of the existing slow lifts in India are the key factors for industry expansion at a rapid pace. Prominent players in the smart elevator market include thyssenkrupp AG, Kone Oyj, Otis Elevator Company, Fujitec, Schindler Group, Mitsubishi Elevator, etc. These companies are constantly developing new solutions and intelligent lift technologies, providing highly efficient control & maintenance services. The players are offering different solutions for different buildings including residential, commercial, etc. Some lift providers are enhancing the connected elevator technologies and delivering personalized services to commuters & building management staff. For instance, in October 2017, Otis announced the launch of its new mobile application, Otis eCall that aids passengers to call lifts in advance. Through this application, the company has utilized the IoT technology to offer enhanced personalized services in the smart elevator market. The smart elevator industry is consolidated in nature. The companies have various technology & service providers that act as local players and provide efficient services related to intelligent lift solutions. The industry is still in its growing phase and has a huge potential over the forecast timespan due to the rising adoption of smart technologies globally. Few smart elevator market players are continuously developing new solutions to improvise the customer experience and gain a large revenue share. For instance, in December 2018, Schindler North America announced the addition of its new cab designer option for architects along with its online planning & design tool plan. The new solution allows architects to design new cabs with various options.